Several years ago, Sister Mary Jean Ryan, Chair/CEO, SSM Health Care spoke to a young, growing, for-profit nursing home company [see her bio here]. She leads SSM, the first Malcolm Baldrige award winner in Healthcare. SSM’s story is impressive: The system began with five religious sisters who journeyed to St. Louis in 1872 from Germany to be of service to people in need. In their early ledgers, the sisters listed patients who could not pay for their care as “Our Dear Lord’s.” To this day, SSM ensures discounts for people without health insurance. Based in St. Louis, the system is sponsored by the Franciscan Sisters of Mary and owns, manages and is affiliated with hospitals and nursing homes in four states: Wisconsin, Illinois, Missouri and Oklahoma. In 2009, more than 2 million people came to us for care. At times the NP vs. FP providers seem worlds apart. They think they’re so different. I now see two types of operators. The two types are not FP and NP. 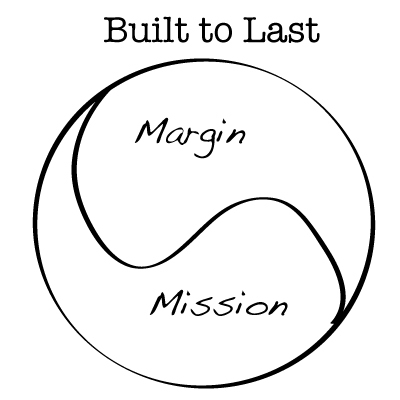 The two types are the ones who are Built to Last (Margin & Mission) and those who are being purchased by the Built to Last operators. Literally & mentally. I eat a lot of food throughout the day — mostly fruits, veggies, nuts, hummus, grains (I’ve sort of become a health nut) but that’s another topic for another day. First, the newest discovery: Freakonomics. Many of you have probably heard of Freakonomics or evenread the book. The authors haves a blog on the nytimes and a podcast that I started listening to just a couple weeks ago. The pack a ton into about 20 minutes … discovering the ‘hidden’ side of all sorts of things. In fact 2 recent episodes prompted me to start a conversation with my partners at work that I think may lead to huge steps forward for us. http://freakonomicsradio.com/the-no-lose-lottery.html The No Lose Lottery episode prompted me to encourage our HR team to see if there was something we could apply to instigate more savings among our employees. Of course we have a 401k like everyone but is there another, cutting-edge option patterned after lottery principles that would be more effective? http://freakonomicsradio.com/reading-rockets-and-rithmetic.html The Reading Rockets and Rithmetic episode hit a nerve big time for me, in light of my recent post on wanting to dedicate my next 10 years to transforming the industry. Got me thinking about how to involve many others in a HUGE way. This American Life sort of started it all for me. I needed a companion during my long early morning bike rides as I trained for my 1/2 Ironman in June 2010. I’d be on rides for anywhere from 1.5 to 3 hours before work (hitting the road at 5am). These podcasts were, and are, gold. They totally get in my head and prompt new thoughts on work and family issues. http://www.thisamericanlife.org/radio-archives/episode/317/unconditional-love Unconditional Love. Act 1 about adopting a challenging child might bring you to tears. Lastly, TED Talks. I discovered these a couple years ago and my wife still can’t get over how I can just watch talk after talk on stuff that’s usually way over my head. Too many others to list. I’m a fan of Pat Lencioni. I’ve used his ‘5 Dysfunctions of a Team’ and ‘3 Signs of a Miserable Job’ many times over the years. While he certainly points to ‘things’ to watch and focus on as a leader, he also subtly makes the point that the influence of the leader is great. His December newsletter (below) makes that same case — without blatantly making it. The leader(s) of the organization’s personality (passion, measurements, values) has a direct impact on the organization s/he leads. I’ve become far less worried about having ‘secret sauce’ stolen b/c, at the end of the day, it’s the people living and executing that secret sauce that really makes it happen. It’s this SOFT stuff that separates the good from the great. Anybody can grow census. Anybody can manage expenses. Anybody can provide adequate care. But, to become great takes a concerted effort to synthesize the values & desires of a leadership team into a common mission and way of work. And then … to stick to it no matter what. Earlier this year I had the opportunity to spend time with the CEO of one of America’s most successful companies, a legendary organization known for its employee and customer satisfaction, as well as its financial performance. I attended their company’s management conference, listened to various presentations about their culture, and the extraordinary, homey and sometimes slightly wacky practices that distinguish them from their competitors. And right away, I knew he was right. After all, every one of those competitors, the vast majority of whom are struggling, knows exactly what this company does, how it works, and how much it has driven its financial success. The company’s cultural approach has been chronicled in more than a few books. And yet, none of them tries to emulate it. In fact, based on numerous interactions I’ve had with employees who work for those competitors, I’d have to say that their attitude is often dismissive, even derisive, toward this company and its enthusiastic employees. And this dynamic exists in other industries, too. A fast-food company I know has remarkable customer loyalty, as well as unbelievable employee satisfaction and retention, especially compared to the majority of their competitors. The leaders and employees of the company attribute most of their success to the behavioral philosophy and attitude that they’ve cultivated within the organization, and the unconventional yet effective activities that result. One example of that philosophy is the action of the CEO, who shows up at grand openings of new franchises where he stays up all night with employees, playing instruments and handing out food to excited customers. Few CEOs would be happy, or even willing, to do things like this, but this executive relishes the opportunity. These, and other activities that most MBAs would call corny, are precisely what makes that company unique. This happens in the world of sports, as well. There is a well-known high school football team where I live that is ranked near the top of national polls every year. They play the best teams in the country, teams with bigger and more highly touted players, and beat them regularly. The secret to their success, more than any game strategy or weight-lifting regimen, comes down to the coach’s philosophy about commitment and teamwork and the buy-in he gets from his players. That philosophy manifests itself in a variety of simple actions which speak to how the players treat one another on and off the field. For example, players pair up every week and exchange 3×5 cards with hand-written commitments around training and personal improvement, and then take responsibility for disciplining one another when those commitments aren’t met. And yet, whenever I explain this and similar practices of the team to other coaches who are curious about their success, I encounter that same sense of dismissiveness. They get a look on their face that seems to say, “listen, I’m not going to do that. It’s silly. Just tell me something technical that I can use.” As a result, few teams actually try to copy them. Some skeptics might say, “come on, those companies/teams are successful because they’re good at what they do.” And they’d be right. Those organizations are undoubtedly and extremely competent in their given fields, and they have to be in order to succeed. But plenty of other organizations are just as competent and don’t achieve great levels of success, and I honestly believe it’s because they’re unwilling to stoop down and do the simple, emotional, home-spun things that all human beings — employees, customers, players — really crave. What’s at the heart of this unwillingness? I think it’s pride. Though plenty of people in the world say they want to be successful, not that many are willing to humble themselves and do the simple things that might seem unsophisticated. Essentially, they come to define success by what people think of them, rather than by what they accomplish, which is ironic because they often end up losing the admiration of their employees and customers/fans. The good news in all of this is that for those organizations that want to succeed more than they want to maintain some artificial sense of professionalism (whatever that means), there is great opportunity for competitive advantage and success. They can create a culture of performance and service and employee engagement, the kind that ensures long term success like no strategy ever could. But only if they’re willing to stoop down and be human, to treat their customers and one another in ways that others might find corny. As an AIT I started out like most — fired up, wanting to treat each resident like family, eager to learn and improve this embattled industry. The empathy I felt was very high. Feeling sorry for a lot of the long-term residents who had no family support. Feeling a bit shocked at the scene of a resident being wheeled down on a PVC pipe roller chair to the shower room covered only with a sheet — leaving a trail of diarrhea. Feeling nauseated by the smells during certain procedures. How do I, having never worked in a nursing home before, get used to that?! Feeling pretty impotent to change things for the better until I learn why they’re done this way in the first place. What have I gotten myself into? You call Virginia in room 24 bed A by a different name: 24-A, ‘the hip’, Medicare Patient, etc. This dehumanizing of ‘Virginia’ helps you cope with all of the residents you’ve let down some way. It also speeds up communication with the others at the facility who don’t really know Virginia. You are less shocked by the sights, sounds, and realities of life as a nursing home resident. You rationalize away your loss of empathy as not a loss of empathy but as a better understanding of why things are always done that way. You spend your time on delivering the things your company measures regardless of how in line with your values or vision those measurements are. You survive for a while and then you begin to thrive. Your experience and success builds confidence to experiment, to find YOUR VOICE. You begin to need more than simple survival. 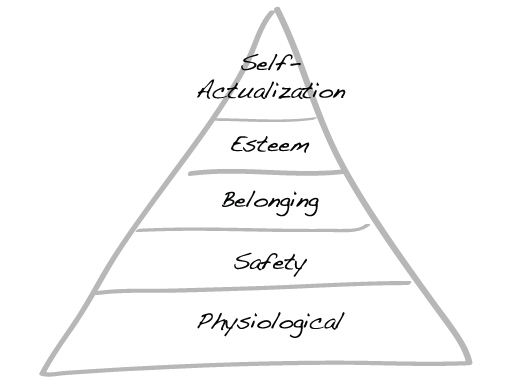 Maslow’s Hierarchy of Needs illustrates a theory of the different levels of human need that you see in yourself as an administrator. This analogy is a bit forced but you’ll get the idea. You first need to survive. That ‘Physiological’ need means you have to not lose your job 🙂 You need to learn, perform to how your measured, fit in, etc. With some time and success your needs graduate to the ‘Safety’ need. Here you pass some surveys; you put a team together; you learn from your mistakes; you change your style to be more effective. You start to float between Safety and ‘Belonging’ as you find some balance in your life. you perform well financially; you’re recognized in your organization as an important partner. 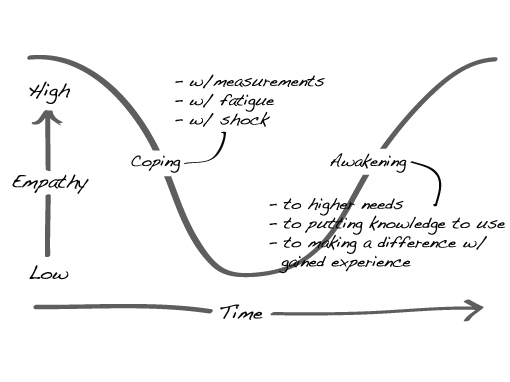 The trouble is … this is the bottom of the Empathy Curve. You may stay here for the rest of your career, quite comfortable. What truly makes us different from our competition (in the eyes of the community)? Wouldn’t our competitors say that they are nice and caring just like we say? What can only we say about being a resident here that our competition cannot? Is it a significantly better experience to be a resident in my facility than at an average facility elsewhere? In other words, is sleeping, waking up, getting dressed, eating breakfast, going to activities, going to therapy, receiving medications, etc. a significantly better experience than your average facility? You feel a higher need pulling you up from the coping gravity to see things (again) from the residents’ perspective. You are extremely proud of surviving and then succeeding at one of the most difficult jobs anywhere. You are proud of how you’ve treated your employees (for the most part). You are proud of the company you’ve helped grow. You are proud of the facilities that have improved qualitatively and quantitatively under your leadership. Now what? Now you feel a new, familiar need to change the industry. You feel a need to fight the CALF PATHS and the gravity that limits our vision of what we can and should do. The difference between that need/empathy today vs. when you began is that now you have the knowledge and wherewithal (what a great catch-all word) to do something about it. There are a handful of companies and leaders in long-term care that are ‘ahead of the curve’ (get it?) when it comes to changing the industry. BUT, it seems like the movement is way too slow. One major initiative is the resident-centered approach as illustrated here. I love the concept. I think it is on target to where we need to take long-term care. But, the cultural, financial, and regulatory obstacles are real and in many cases prohibitive for an administrator to experiment with. For my next 10 years I want to work at clearing those obstacles away. AND, more importantly, I want to figure out how to lessen the slope and duration of the drop and bottom of the empathy curve for others. Skilled nursing companies have to find the right people, find the right measurements and establish a culture of entrepreneurship and innovation in order to do more than simply survive. We and our residents ‘need’ it.